New footage from this year's deadly school shooting in Parkland, Florida, shows officials were "underprepared" and "overwhelmed", local media say. The footage shows "58 minutes of chaos" on the campus, the Sun Sentinel says. "A gunman with an AR-15 fired the bullets, but a series of blunders, bad policies, sketchy training and poor leadership helped him succeed," the Sun Sentinel says, after it reconstructed events using surveillance footage and official reports. Why are mass shootings getting more deadly? The Sun Sentinel's timeline shows that despite the suspect entering the school campus with a rifle bag, several members of staff appear to fail to promptly report a Code Red - a measure that could have put school students into lockdown. Instead the building's fire alarm went off, prompting some students to leave their classrooms, heading towards harm's way, footage shows. Authorities say Nikolas Cruz, a former student of the school, killed 11 on the school's first floor and six more on the school's third floor. But both the Sun Sentinel's investigation and the commission have pointed to wider policing failures. "Since Columbine, officers are taught to rush toward gunshots and neutralize the killer. But the first Broward deputies don't rush in," the Sentinel reports, referring to the 1999 Colorado school shooting that left 13 people and two perpetrators dead. As the Sun Sentinel put it, "Cruz has already walked to a nearby Walmart and ordered a drink at Subway" while police believed he was on the building's second floor. 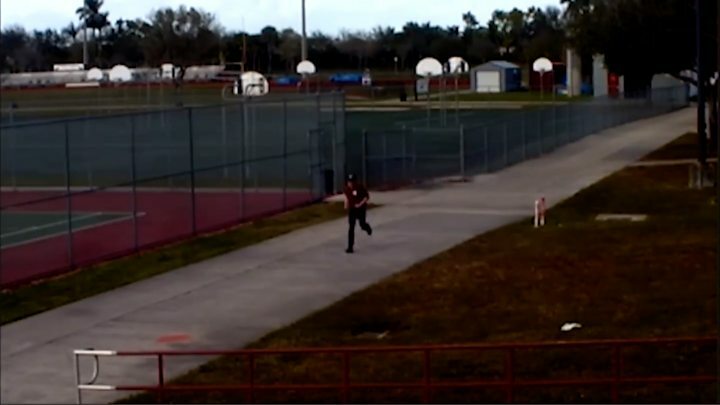 The newspaper's investigation included newly available footage of the gunman running away from the school after he discarded his weapon, in an attempt to blend in with evacuating students. Andrew Pollack, whose daughter died in the shooting, shared the Sun Sentinel's piece on Twitter - describing the alleged failures it laid out as "heartbreaking". He also called for Broward County's Sheriff, Scott Israel, to resign from office. The sheriff has faced mounting pressure regarding his office's handing of the shooting. Following the draft report, Mr Israel released a document detailing changes implemented already - including additional training for its officers. In a statement this week, he asserted the reforms were "not the end of the process", insisting it would also implement recommendations from the commission. The commission's panel voted 13-1 in favour of state lawmakers allowing trained teachers to carry firearms in school. The proposal is backed by President Trump, and earlier this month his administration's Federal Commission on School Safety also threw its support behind it. In 14 US states, there are already some teachers that carry guns - but a wider policy remains politically divisive. One of school's students who helped lead national protests in the aftermath, Cameron Kasky, wrote for CNN that he was "shocked" by the recommendation and denied it would make him feel safer.